In today’s market, those that are most visible to their potential clients will have a stronghold over the local economy. There is no room for ambiguity on this point. While your competitor is investing in their business with clever strategies to be known on branding and reputation, your company can be left behind the race. The good news is that you can catch up quickly by utilising some clever tactics to re-engage those that might have overlooked or forgotten that your services even existed. All it takes is one search on Google to get the customers ringing the phone. The trick is convincing the search engine you are worth the hassle. 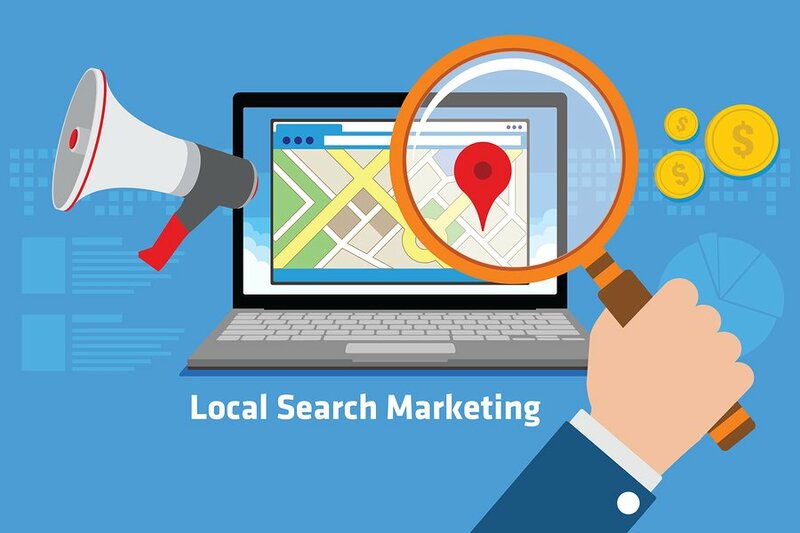 Local SEO is a great way to connect with geographically close customers. Becoming relevant in a local context though must be considered away from general theories on Search Engine Optimisation (SEO). Towns, suburbs and close-knit communities are more likely to stick to what they know and trust, contrasting from major cities and metropolitan areas that are more inclined to change and adapt to modern circumstances. 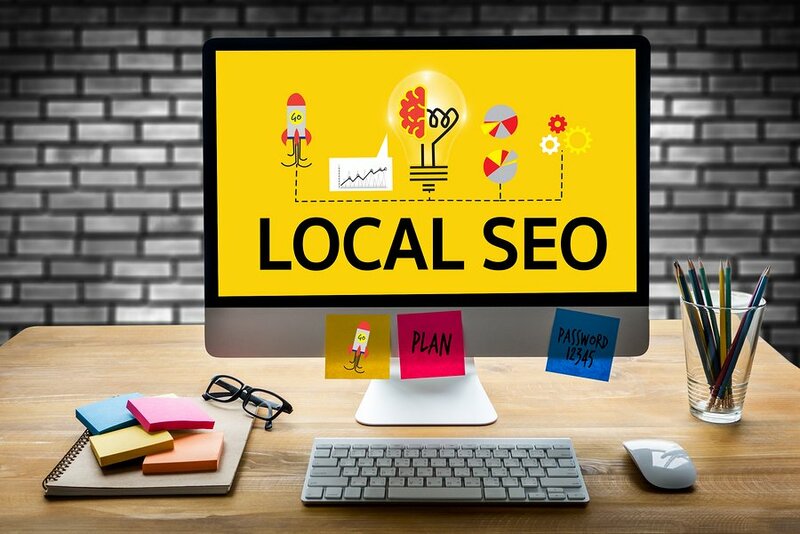 If you happen to be a new or established barber shop, butcher, hair salon, dry cleaner, accountancy, doctors office, retail store, restaurant, café or any other type of business that requires a strong local presence, then following a local SEO checklist is strongly advised. This does not necessarily apply to large corporation chains or those organisations that are seeking a national or global footprint. Small businesses can really benefit from local SEO. Before we get cracking with the 8 categories in the ultimate local SEO checklist, it is important that we mention something. The key objective of your operation is to be the number one hit, or at least in the upper echelon of hits, for a potential customer to discover when they type in a request into Google. Screenshot from Google search results. When Valentine’s Day comes around in Campbelltown, NSW and a husband is on the lookout for the best florist in the region to give his partner a lovely bouqe to mark the occasion, they will typically type “florist Campbelltown”. That then produces a search of the top 3 hits that match the description, giving the business name, a customer review rating out of 5, a location and operating hours. 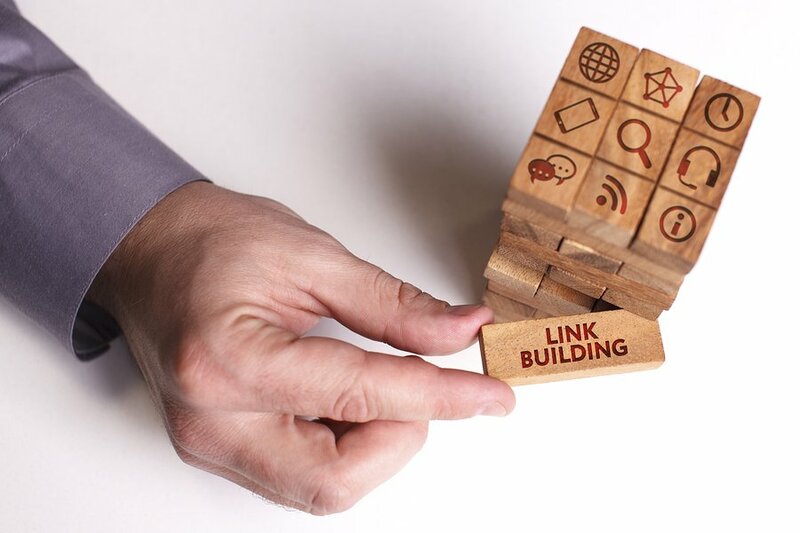 Building quality links is an important part of local SEO. Any website that achieves any degree of success when it comes to Google has managed to include quality links. These essentially work as endorsements from external sources to give you the vote of confidence. The more votes you receive, the greater the likelihood that Google will recognise your listing and have it higher on their platform. In this spirit, link to local blogs and connect to local sites to establish peer-to-peer relationships. The easiest method to building strong links is to find industry-based websites that are peer reviewed and supported by research. Citations – A total or partial description of your contact information and website packaged into a single reference point. Contact NAP – Name. Address. Phone number. Google My Business – This is a free service that lists your business online. 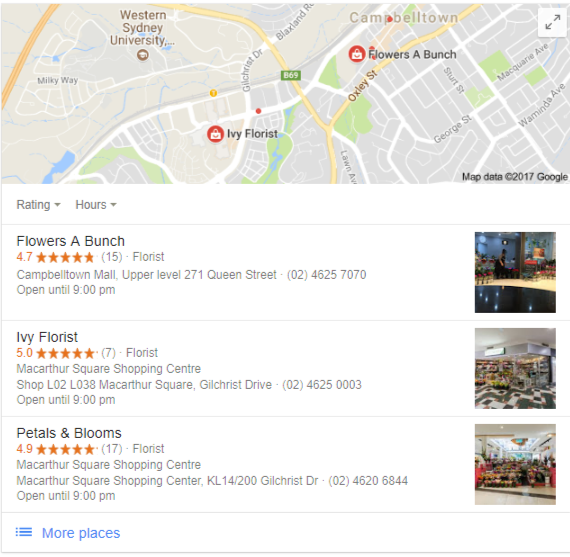 Google Maps – Location is the driver of local SEO. H1 heading tags with the keyword/s. H2 and H3 heading tags. A description overview that is anywhere between 50-70 words. Example of tags and description in a search engine listing. There is a tremendous amount of code and algorithm surrounding schema, but the markup code essentially works to understand the finer details about the search. Rich snippets allow the customer to know what they are getting from the prospective business. This is particularly important if you are selling actual products. This creates a more engaging search engine listing and with a location implemented to the desired area, the website will have more authority and as such, more clicks. Example of a rich snippet search engine listing. It is easy to forget when you are busily crafting your website and social media portfolio that many of your customers won’t have either the luxury or inclination to search on a desktop, laptop or tablet device. 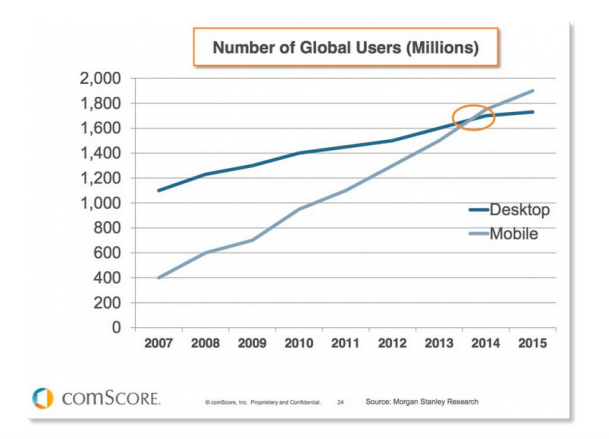 According to ComScore, the global use of mobile devices for Internet use surpassed those on other devices like a desktop in 2014. Fortunately, Google has a free and easy to use tool that tests your page to see if it is mobile-friendly for the user. Some sites do neglect their efficiency on a mobile device, leading many users to find unwanted pop-ups or images and text that is out of proportion. Given the difference in choice of providers out there, whether the mobile is an Apple iPhone, HTC, Samsung, Nokia or Google Nexus, it is key that the URL site is simple and consistent. 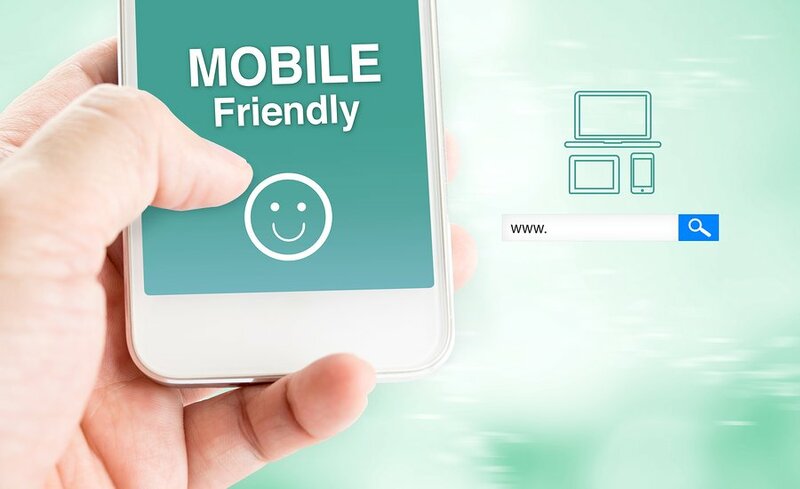 MobileTest.me is an ideal testing kit to see if your business is geared towards all of these diverse platforms, checking functionality on smartphones and tablets alike. To drive the point home further, multiple studies have discovered that a higher percentage of mobile consumers are likely to visit the store they have searched within 24 hours than their desktop counterparts. Speed of service is key and should your site show up poorly on a hand-held tool like a smartphone, then it is unlikely your business will thrive. Unique written content is the target. Whatever topic you are specialists in, ensure that your pages have informative articles that discuss and update the consumer on whatever you are selling. They can arrive in the form of hard news, blogs or opinion pieces. Each page should have at least 200-250 words that includes localised specifications of the town or city you are based in. If you are writing a blog in particular, then the word count is much higher – sitting at 2,000 words (if you want a top ten ranking). 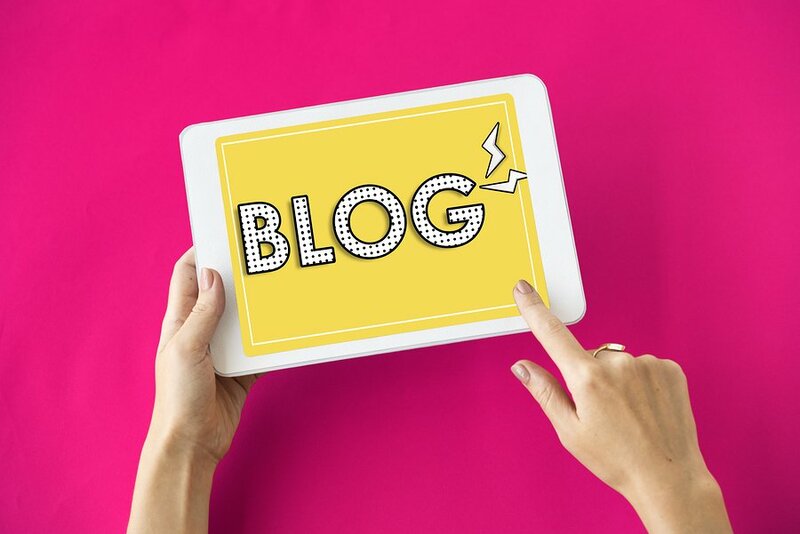 Your website should feature a blog. If you run your business properly, you will have a number of satisfied customers who have parted with good money and gone home happy. Do not let that opportunity escape you. 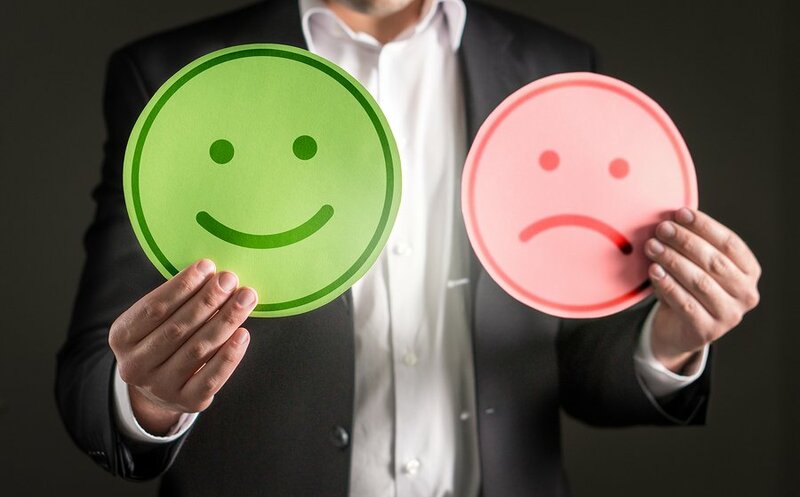 Interview or survey them to find out what made them satisfied. Publish that on your website and on the appropriate social channels. Continue to update on a weekly basis. Plain text is more than useful, but every website requires a degree of interactivity to keep the customer engaged. This requires video and images to jazz up the aesthetic and as a result, boost your SEO. The best video platforms include; YouTube, Vimeo, Dailymotion and Metacafe. Images that are uploaded must adhere to key SEO principles as well. The file name, size, title and alt-text should include crucial details about the name and location of the operation. Ensure you have an active presence on social media. This area is designed not to sell the customer, but discuss and connect them to where they want to go. Once you have a logo that is recognisable and a reputation to uphold, it is time to spread that brand across a number of specified domains. 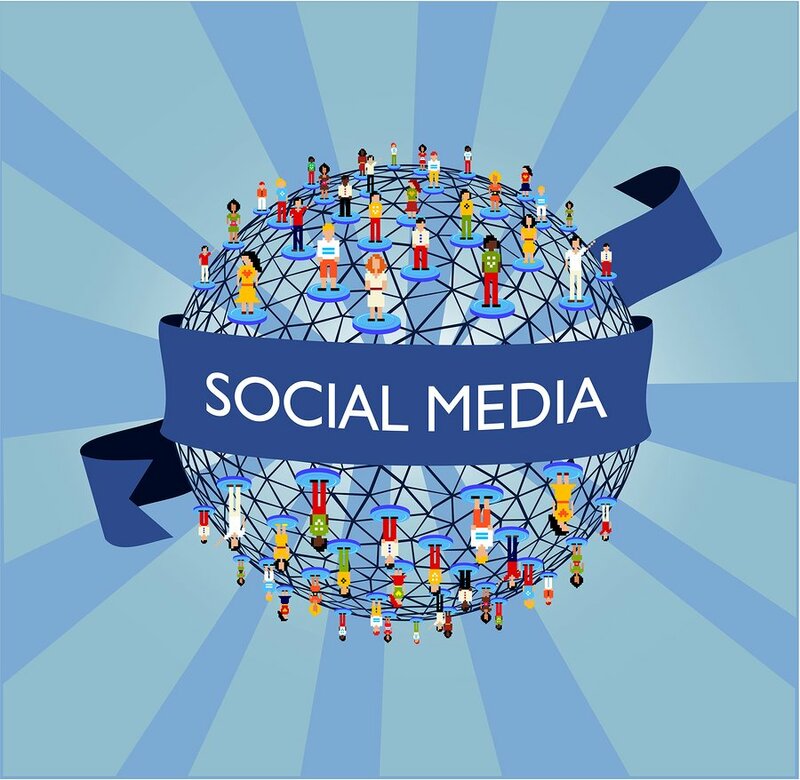 Remember that your customers have different tastes when it comes to social media platforms. While some prefer to stick to Facebook or Twitter for their interactions, others refer to Yelp or image-based sites including Instagram and Pinterest. Keep the content light and friendly, and open dialogue with the customers. Make sure you showcase quality reviews. First and foremost – DO NOT engage with fake or paid for reviews under any circumstance. Businesses that have engaged in this type of underhanded activity have a habit of being found out and when they do, their reputation is forever tarnished. Good word travels fast, yet the flipside of this is also true. It sounds simple enough, but you would be surprised how many times a satisfied family have come to dine at a restaurant only to leave without offering any value beyond their own stay. 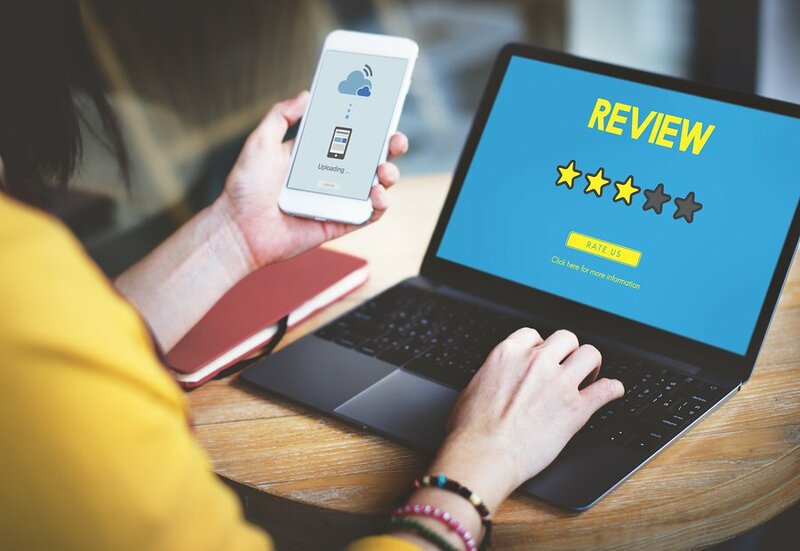 It is a relatively new phenomenon to ask for consumers to review your service, but if you can even offer a discount or incentive like a draw in a collective prize to rate and promote your business, the word will flow. Point them to Google reviews, Yelp, Facebook or anywhere else you deem necessary. These need to be highlighted and put up in big neon lights, plastered from top to bottom of your promotions. “This was just what I was looking for” commented John. “I absolutely loved this place, I will tell my friends” remarked Kathy. “The service was fast and the food was delicious. I will be back” complemented Todd. Use these quotes and drive the point home. They are your best ingredient after all. In business you are probably going to see both positive and negative reviews. They are part and parcel of the business world. Rather than delete them, ignore or respond with vicious attacks that attempt to demean the consumer, try and find out what the problem is. Was it the service? The pricing? Be polite and courteous and others will realise that you care about every customer. 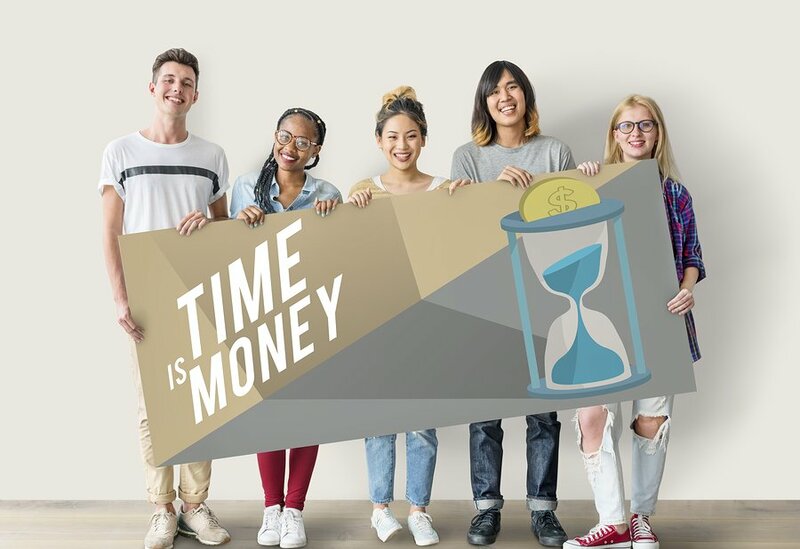 It might be an unfashionable aspect to think about for Gen Y business owners or those pushing for new trends, but some old and tested methods remain as true today as they ever were. Building a strong local presence goes beyond any tactic that can be implemented by a website change here, a link there or a social media update. Many of the top hits on Google began with an established reputation as it graduated to an online stronghold. Go back to basics and excel before moving on! Keep advertising through local means i.e. newspapers, events including fairs, open school days, posters, billboards, flyers, sponsor local charities, radio and television. Hire, train and manage enthusiastic and well regarded employees who preferably live and operate in the area. As a manager/owner, ensure you hold meetings to be on top of issues that will arise with the staff. Businesses will always encounter problems along the way and the best practice is open transparency where issues can be identified and dealt with immediately. Be available for customers on hand to create and build rapport between yourself as an owner and the cliental. They will likely want to come back if they feel welcome. Develop networks and connections with other well established local businesses. Many recommendations can flow on from this. Seeing these steps through will make it more likely that customers will review you positively online. 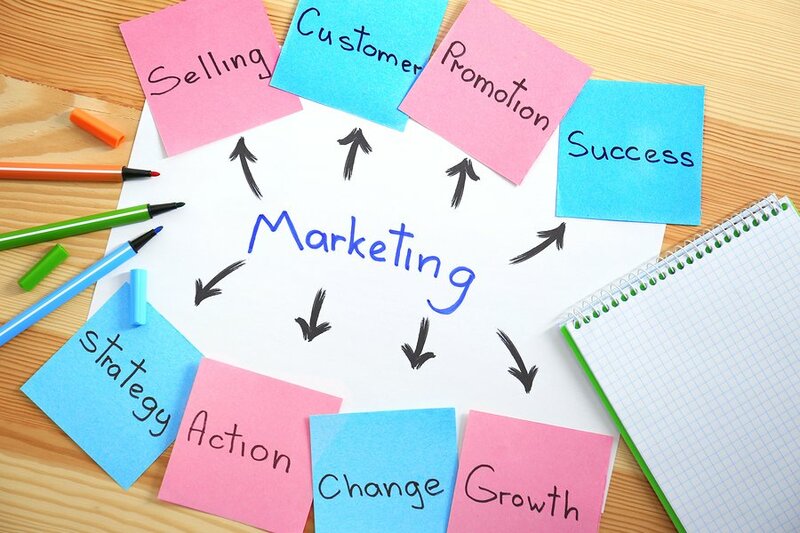 Physical marketing vs. digital marketing is never a case of one over the other. It is about working side-by-side to ensure the maximum result. Remember that Google rankings are always in flux. Those businesses that sit back and become complacent will fall down the pecking order while others that engage in these 8 steps will quickly ascend. Consider these tactics as best practices that will ensure your operation does not get left behind. 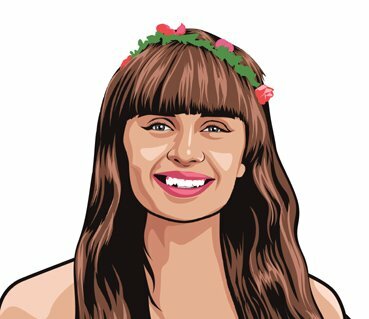 No one is expecting the spectacular when it comes to this domain, just that the key boxes are ticked so the consumer is not left in the dark. What are your thoughts on the checklist? We would love to get your feedback on the strategies and find out if you have others that have worked for you. Let us know in the comments below. Thanks 🙂 We are glad you like this article! The Best Social Media Tools to Boost Your Business The Biggest Social Media Myths Entrepreneurs STILL Believe!